Join us for a "Shark Tank" style pitch event in the heart of downtown Carbondale. COVENTURE, Carbondale’s new business development & cowork nonprofit, will host a “Shark Tank” style pitch event at the Third Street Center on Friday, April 12, 2019. The 7PM main event will be preceded by a panel discussion from 3:30-5:30PM by distinguished guests from around the state on venture and angel investing. Food & beverages will be provided by local restaurants and brewers. Participants and accredited investors can register online at COVENTURE.io. 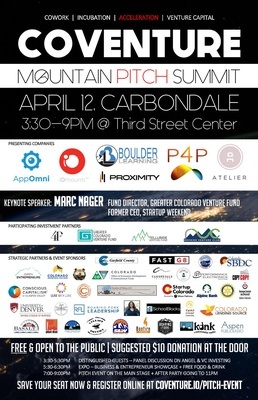 Mountain Pitch Summit is FREE and open to the public, with a suggested $10 donation at the door. This year, COVENTURE is pleased to welcome the most reputable members of the investment community from around the state. They'll be intently focused on 6 pitch-ready companies putting everything on the line, trying to make a deal that could change everything! Visit our website at COVENTURE.io to see who will be presenting and who will be our distinguished guests. Event Schedule: • 3:30-5:30PM Guest Panel on Venture and Angel Investing (Calaway Room) • 5:30-6:30PM Community Expo Featuring Local Entrepreneurs | Food Service by Local Restaurants (Round Room) • 6:30-7:00PM Guests Take Their Seats (Community Hall) • 7:00-9:00PM Pitch Event (Community Hall) • 9:00-11:00PM After Party & Networking (Community Hall)? COPYRIGHT © RIFLE AREA CHAMBER OF COMMERCE. ALL RIGHTS RESERVED. WEB DESIGN BY ALIGN MULTIMEDIA.